Ouimet with the H800 3D Printer at Portland Community College MakerLab. “We use the Afinia H800 3D printers for large format printing, or for projects that require fine detail. They are really good machines!” exclaims Ouimet, who has created several projects on the Afinia 3D printers. 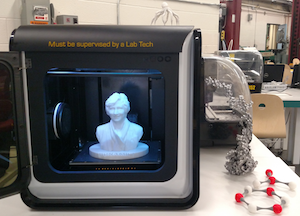 The Afinia H800 3D Printer with students’ prints. Although many people view 3D printing in makerspaces as a way to create hobbyist items, Ouimet explains that he’s seen a variety of projects created with their 3D printers. “About 60% of the projects students complete are for class and 40% are for fun. We get a lot of engineering students using the printers. For example, many electrical engineering students use them to print cases for circuit boards, or whip up other crazy and cool gadgets. However, lots of art and sculpture students are common, too,” clarifies Ouimet. “Some of the students in our machining program are really interested in additive manufacturing… maybe because it’s different from the CNC/subtractive manufacturing that they use so often,” Ouimet adds. Ouimet explains that students of all different study backgrounds come in to use the technology, as does a decent amount of staff and faculty. “The faculty finds it really helpful for demonstration pieces. For example, chemistry professors can use it to print organic chemistry models,” he says. “I’ve had really good experience, overall, with the Afinias, the H800s especially,” Ouimet states enthusiastically. “They’re very reliable and the software is one of the easiest I’ve used to navigate.” Ouimet explains that he owns a different brand of 3D printer at home (which he purchased prior to using an Afinia), which he described using less-than-desirable terms. The lighting feature on the H800 also gained praise from Ouimet. “The lights on the build platform are very helpful. I’ve heard this from other people, too. It’s just nice to see at a glance what the printer is doing. Even with the doors closed, you can see the light penetrating through the front panel. That’s super nice when you’re monitoring multiple printers,” he explains. “Oh, and of course the controls that are right on the machine are excellent. 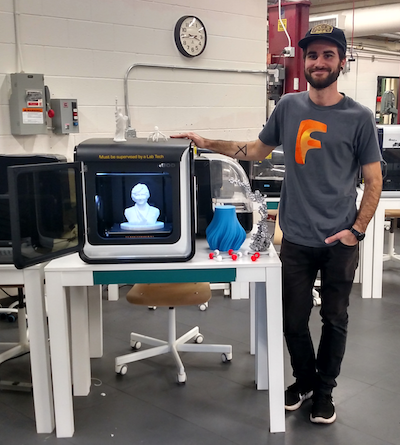 They’re really intuitive, and the overall design is so sleek.” Ouimet admits that the Afinia H800 3D printers are actually placed strategically so they are the first ones to be seen upon entering the MakerLab. “They just look so cool,” he says.